Lawn Sand The traditional treatment to control moss. Apply at 135gms per square metre, either by hand or with a spreader. We recommend you mark out square metres on your lawn using either pegs and string or canes. Wear gloves and sprinkle the product evenly as you can at a rate of 135gms per square metre (4oz per sq yd). Initially, spread the recommended amount over one of the squares and then use this as a visual guide for the remaining squares. Set the spreader to the setting that will dispense 135gm per square metre (4oz per sq yd). Leave the Lawn Sand to work for a day without watering. If it does not rain within the next couple of days water in thoroughly to make sure the Lawn Sand is taken down into the grass. Avoid walking on the lawn until it has rained or been watered in. Wait 3 days after application before mowing the lawn. The moss will blacken as it dies and can be raked out after 7-10 days. A second application may be required after 6 weeks for lawns badly infested with moss. CHILDREN AND PETS. Children and pets can use the treated areas once the product has been watered in. GRAZING PETS. Keep grazing pets, such as rabbits, off treated areas for 4 weeks. NEW LAWNS. 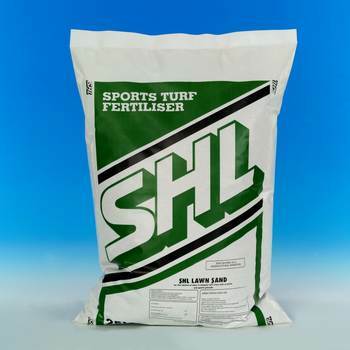 Do not use this product on newly sown grass or turf within the first six months. RESEEDING bare patches can be done 4 weeks after applying the product. TREES AND BULBS. The product can be used around trees in the lawn but avoid contact with the foliage. Wait until all bulb foliage has died down before applying to lawns with bulbs in. STAINING. Ferrous sulphate can cause stubborn stains so avoid the product coming into contact with clothing or any surfaces other than the grass. Sweep up immediately if accidentally spilt. •Active Ingredients: NPK 4-0-0 + Ferrous Sulphate. •Feeding Recommendations: Anytime between late Spring and early Autumn. •Useful Tip: Do not apply on wet or damp grass or in frost or drought conditions.